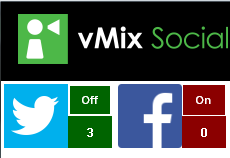 To connect to a Data Source to start receiving Social Media Content click the On/Off button next to a Data Source. Multiple data sources can be enabled at the same time. Green means the data source has successfully connected and is currently updating in the background. Red means the data source is either not connected, or an error has occurred, you can click View Log to find out more information about the error. The number underneath the On/Off button shows how many entries have been received by the data source.